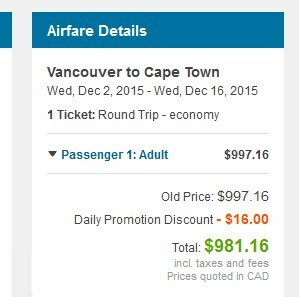 It's certainly not every day that there are flights between Vancouver and South Africa for under $1000 roundtrip including taxes. Click through from Kayak to FlightHub to complete your booking. The flights are with British Airways between Vancouver and London, UK - and with Iberia between London and Cape Town. For live discussion of this deal, or to get some amazing travel advice (to anywhere) from 24,357 fellow travelers in Vancouver, join us in the YVR Deals Facebook Group. vancouver, yvr, flight deals, southern africa, iberia, africa, south africa, british airways, cape town and cpt.